When to use: If market is near A and you expect it to start moving but are not sure which way. Especially good position if market has been quiet, then starts to zigzag sharply, signaling potential eruption. Profit characteristics: Profit open-ended in either direction. At expiration, break-even is at A, +/– cost of spread. However, position is seldom held to expiration because of increasing time decay with passage of time. 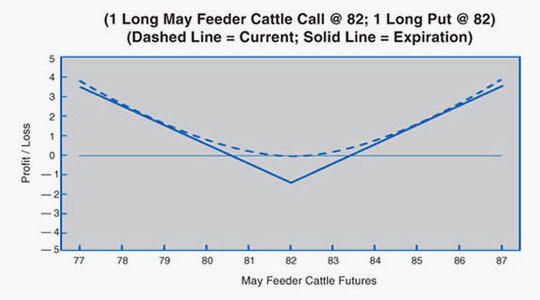 Loss characteristics: Loss limited to the cost of spread. Maximum loss occurs if market is at A at expiration. 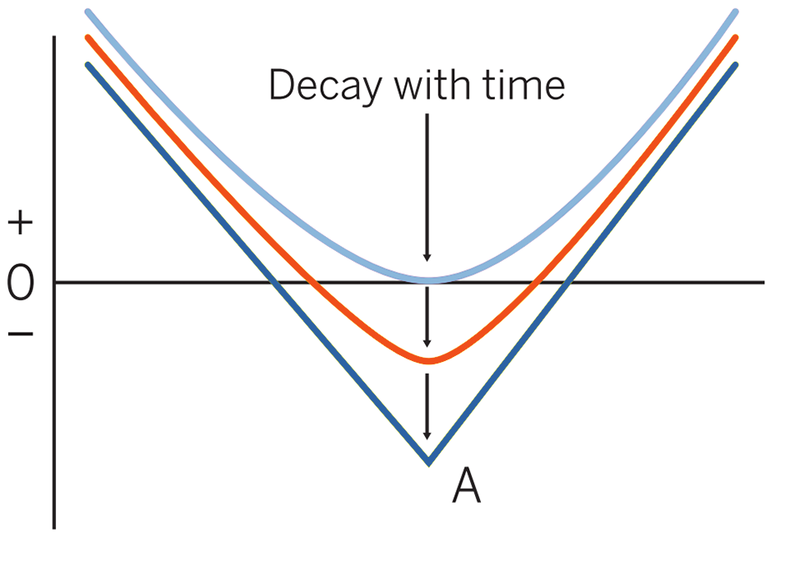 Decay characteristics: Time decay accelerates as options approach expiration. Position is generally liquidated well before expiration. by the delta of the written option). This trader looks at the low implied volatility and feels that options are relatively inexpensive. The expectation here is that this market is poised for a big move. However, the trader is not sure which way it will be. So a decision is made to buy both a call and a put. Breakeven: Downside: 80.50 (82.00 strike – 1.50 debit). Upside: 83.50 (82.00 strike + 1.50 debit). Loss Risk: Losses bottom out at 82.00 strike with a maximum loss of 1.50 ($660). Potential Gain: Unlimited; gains begin below 80.50 breakeven and increase as futures fall. Also, gains increase as futures rise past 83.50 breakeven. This is primarily a volatility play. A trader enters into this position with no clear idea of market direction, but a forecast of greater movement (risk) in the underlying futures.